You read that right, they’re happening! We’ve heard your feedback on topics such as cooldown dependency, difficulty in juking and dodging, and the overall slow feel of moving around in Battlerite. These are all problems that we want to tackle – so, let’s dive into the solution. Along with movement speed increases across the board, the health of all our Champions is being lowered. On a case-by-case basis, we’ll also be adjusting the area-of-effect sizes and timings to ensure a similar hit rate for abilities that need it. This will increase the speed and volatility of the game all around. With movement being a greater factor in how you can position, juking and mind games will be more impactful and less dependent on cooldowns. There will be a greater skill differentiation for the players who are able to keep a consistent hit rate in the new environment and a greater portion of your survivability will be coming from your ability to dodge because of the lowered health. There are a lot of implications to take into account when changing a major stat in this way. The balance of power between melee and ranged Champions can shift dramatically, the time-to-kill and damage output versus healing output can be ruined, and the hit rate of essential moves such as Lucie’s Panic Flask and Varesh’s Shatter can be heavily impacted. Since fine-tuning and balance of these factors is vital for Arena, finding the right amount of speed increase and right amount to boost projectile speed as a counterbalance was a careful exercise. We’ll continue to monitor hit rates and game feel, and make adjustments as necessary. We’ve been looking at ways to diversify player choices and address the problems of staleness, repetition, and the lack of meaningful strategic choices, especially from round to round. While Battlerite’s main focus is and always will be a streamline fine-tuned combat experience, having additional strategic depth is important for the longevity of the game. In the old Battlerite system before being reworked to choosing a loadout of five rites, players chose a Battlerite each round to further customize their Champion. While this had the nice effect of giving progression to each game, it fell short in the customization department. Since Battlerite synergies had to be planned for rounds in advance and some of the more interesting Battlerites were gated until later rounds, players had much fewer options than it seemed. We’ve opted to go with a new system that will allow players to personalize and customize each and every round to their liking – this is the Armory. The Armory will be available before each new round begins, allowing players to pick a set of items they choose to bring into battle with them. These items are not persistent between rounds, and the number of items you can choose to take into the fight increases by one each round, up to a maximum of three items. This will add extra depth in knowledge, skill, and teamplay that will give you more ways to outskill your opponents by coordinating chosen items with your team. By choosing items that improve the matchup against the enemy team, you’ll be able to gain a strategic edge in combat even if your Champions may be disadvantaged. This system also allows for players to change their style or tactics in a more apparent way from round to round. Have I ever told you about Teldo’s Quickblade? 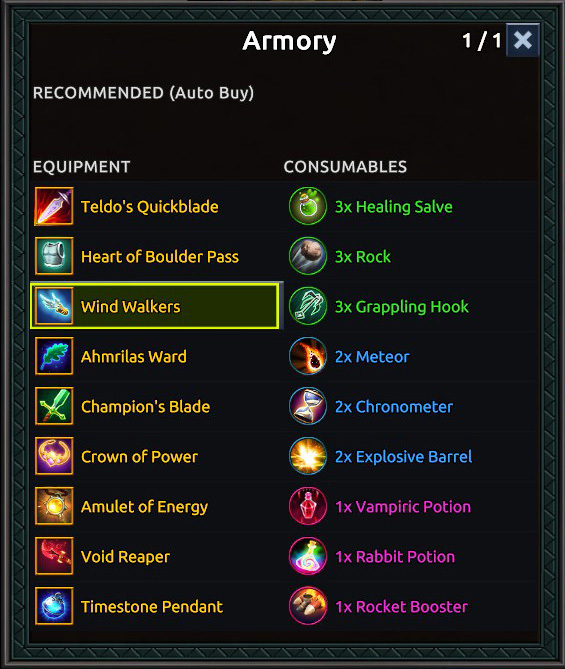 The implementation itself is an almost direct transplant from Battlerite Royale, as you’ll recognize the familiar appearance of equipment and consumables. It gave us the ability to quickly add in both round-long bonuses and one-shot effects. The variety it added was something we really liked, and we started trying it in Arena once concepted. We’ve come up with a brand new set of items fit for Arena, although some fan favorites in Royale have given inspiration to the Arena designs. Overall, you’ll get a very different experience when using them in the Arena compared to Royale. A lot of people come to Battlerite looking for the pure adrenaline-fueled combat. While each round starts out strong and escalates as players build up energy, the ends of the rounds are much less consistent. Final one-on-one duels in the eye of the Death Vortex are some of the most rewarding experiences players can have, but few rounds end that way. Instead, many rounds end in a one-on-two or one-on-three scenario, where the larger team outlasts the remaining player slowly and by relying on their damage output advantage. It’s not the most fun experience for either team, and while comebacks are absolutely a possibility, it takes a proportionally far higher skill in order to overcome the disadvantage. Cranking up the risk and reward at the end of the round, Overload is meant to create volatility and open up the door to comebacks for those who are good enough to make it happen. Overload ability becomes unlocked by the death of an ally. Using the ability restores a portion of the player’s missing health and grants a buff that lasts 8 seconds. During that time, the player moves faster, has increased cooldown rate, outputs more healing, and deals dramatically more damage. However, the player is also vulnerable and will take significantly more damage from opponents. It will still take a great deal of skill to mount a comeback, but now the round will end more decisively either way. 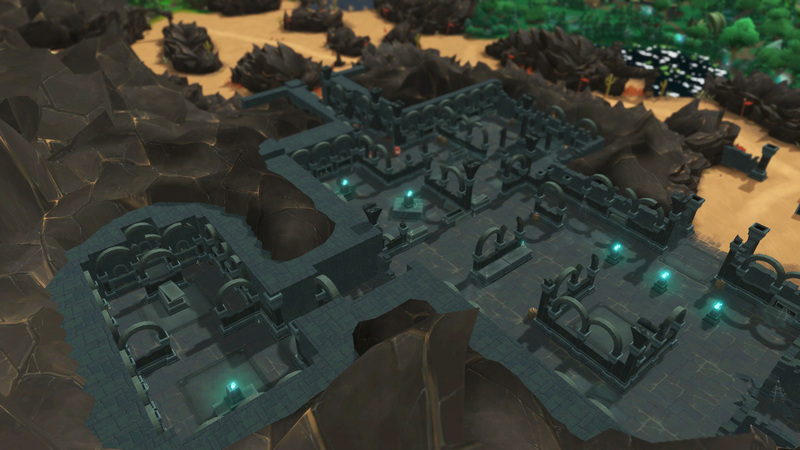 To increase the variety in our map pool, we’ve decided to make some changes to existing maps! These changes are more experimental and it’s hard to know the exact effect on the game; with this in mind, we’re willing to iterate upon this and adjust it as needed. We’ve only added them to a few maps, so you’ll be able to veto maps that you really don’t enjoy. Now let’s get into the actual changes. In Meriko Summit & Blackstone Arena (Day and Night), you can now find explosive barrels. These explosive barrels can be detonated by either team to block off an area with a big explosion, leaving a fiery damage zone on the ground for a time. Explosive barrels can be knocked back and pulled for potentially devastating effect. We think the dynamic zone control offered by explosive barrels will bring interesting new gameplay to players able to take advantage of them. On Daharin Battleground & Skyring (Day and Night), jump pads have been added. While the jump pads in Battlerite Royale are used to travel great distances or escape the Death Vortex, the ones used for Arena have been adjusted to allow for repositioning, a quick disengage, and initiation. Because being away from your team is significantly more impactful in arena and the combo potential is higher, the airtime for the jump pads is dramatically shorter and the incapacitate upon landing is also shortened. Jump pads will offer a new type of contestable map objective for teams able to recognize good timings to utilize them. Royale is getting its own set of adjustments, just in time to celebrate the free to play release! The map is a central part of Battlerite Royale, and a lot of it was designed before we knew exactly how the game would play out. We’ve learned a lot about what works and what doesn’t work, and we have a lot more ideas we want to experiments with to really push the map design further in terms of gameplay and variety. Some areas have worked really well and other places need some adjustments. We also just want to keep things fresh and add new areas for players to discover. The changes will focus on making more looting routes viable and adding value to unused areas. Within the locations themselves we want to open up for more variety and asymmetry to enable game plans and make dropping on the map more interesting. Most locations now have a bigger chamber or house where a plethora of loot can be found at the risk of being the target for an ambush or having to fight other players early on. Remember to take your jackets! The Frozen Plateau to the northwest and the Trader’s Isle to the southeast are two of the new areas added to Talon Island. Another location, Grayheart Pass, has been merged with the Abandoned Mines to create one large mining town. Anvilfall and Oakenheim Village have also received significant layout reworks. Crumbling Keep has crumbled further, revealing new passages. Some of the rubble has also been cleared in the Ancient Tomb, revealing an additional chamber inside! Besides the landscape changes, a bunch of regional objects that players can interact with have now been added to certain parts of the map. 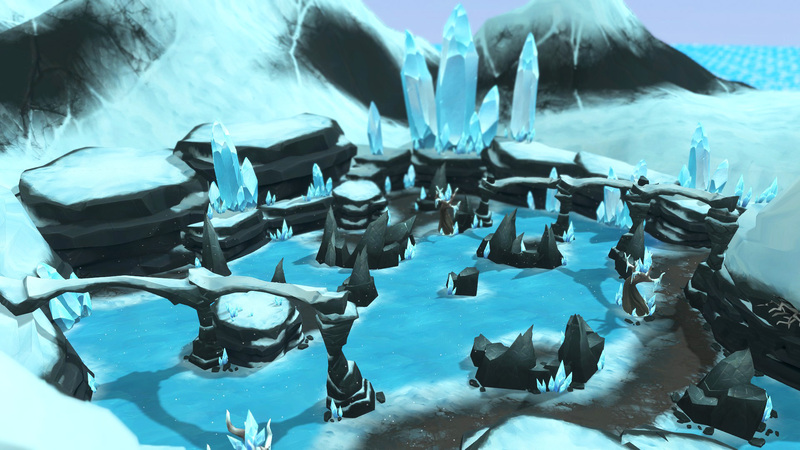 For example, there are icicles in the colder areas that will create ice patches on the ground when destroyed, or rocks near the mines that can be attacked to acquire throwable rocks. We don’t want to share all the secrets here though – so we’ll just end by saying that you should keep an eye out for the Cursed Urns. Note: Cursed Urns do not appear to be labeled with a warning. But they probably do something Not Good. The final three Champions are coming to Battlerite Royale with the Free to Play launch! We all blame Oldur, just so you know. Converting Arena Champions to Royale Champions always takes a reasonable amount of time, as we need to balance preserving the feel of the Champion with also making them feel at home on Talon Island, where the variables are very different. This is especially true with supports in Arena moving to Royale, as all Champions need to be self-sufficient to some degree to be viable in solo queue. In the Royale timeline, Oldur is a offense ranged Champion that has tools to bring the fight to his enemies. He can stack up his Time Bombs, his Stone Glass has transformed into Temporal Strike that dashes forward and deals damage, and his Ultimate allows him to distort time around him. Instead of Rejuvenating Sands, Oldur has Chrono Bolt to pop Time Bombs and disrupt his foes. Taya dashes into Royale with her hit-and-run playstyle. While her playstyle remains faithful to her Arena incarnation, she learns quite a few new tricks for Royale. Her X-Strike pierces walls to strike at cowering foes, her Wind Strike has been replaced with its EX variation Zephyr and can now dash through walls, and her Tornado has been turned into a Tornado Trap. Pearl’s charged Volatile Water (M1) is now her M2 and given a new name, Aqua Pulse. It also inflicts a Fading Snare instead of Silence. Her Bubble Barrier has been replaced with Ocean Sphere, which summons a helpful healing pufferfish that moves in a target direction and explodes if hit by Pearl’s Volatile Water or Aqua Pulse, dealing bonus damage. 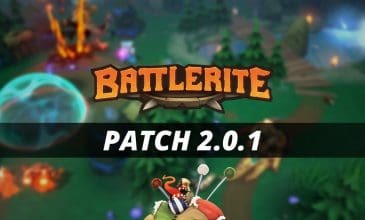 Coming with the Battlerite Royale Free to Play Launch and the Big Patch™ will also be the Battle Pass. More precise details of the Battle Pass will be released when we launch a website dedicated to it on Thursday, February 7th, but for now we can tell you that there will be a Free and Premium Battle Pass, and that it will cover both Battlerite and Battlerite Royale. It’ll be filled with tons of goodies (and perhaps a new kind of cosmetic) that you’ll be able to unlock during the very first Battle Season. Besides that, Sponsors will also become available in Battlerite Royale and, like the Battle Pass, progress on Sponsors in one game will hold over to the other. And since sharing is caring, quests will also be shared between Battlerite and Battlerite Royale! But I’m spoiling the fun! Stay turned for the Battle Pass website launch on Thursday, for now – you’ve got a full belly of gameplay changes to digest!